Expansive 1450 sq. ft. light and bright in mint condition two bedroom and two bathroom coop with home office and option in a well managed full service coop. Converts seamlessly to a generous three bedroom offering unbeatable value. 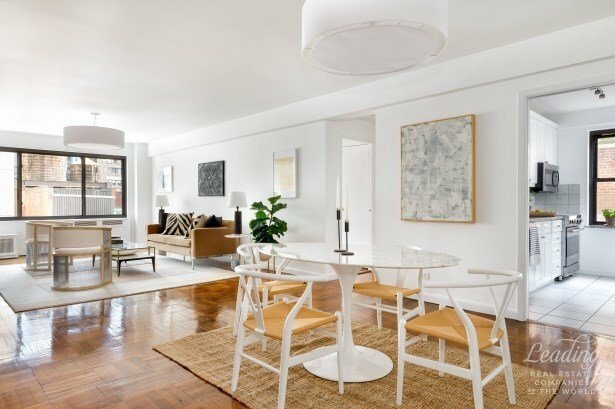 This renovated corner apartment has double paned windows that allows for sun-filled rooms. The apartment has a gracious foyer entrance with sitting/storage bench and double closets then leading to an expansive open plan living and dining room with approximately 36 foot length. You will be delighted with the chef's windowed kitchen: Viking range, GE microwave and dishwasher, granite counters, numerous custom storage cabinets, etched glass pocket door that closes off the kitchen when entertaining. The master en-suite is exceptionally over-sized and could easily become two bedrooms, each with large closet space, currently set up as a large bedroom and sitting room combination. There is a large California walk-in custom closet and another large closet with ample storage. The windowed master bathroom has a granite vanity sink plus a linen closet. There is a home office space with great custom storage. At the other end of the apartment is the large second bedroom with two window exposures, along with good closet space. The second windowed bathroom has tiled walls with a fancy border pattern plus a linen closet in the hallway. Thru out the apartment are parquet hardwood floors, radiator and air conditioners enclosed in custom mill work, custom overhead lighting and spots. The full service building allows pets, Pied-A-Terre and has: an elegant lobby, live in super, 24-7 doorman, amazing common roof deck with city views, common laundry room, gym, package room, private storage rooms with small fee, bike and trunk rooms, an outside private serene gated garden. Also in the area are great restaurants, shopping, children's' playground, East River Park. The location gives easy access to airports, Grand Central Station and Penn station. Estimated measurement taken from refinance appraisal report.